It's not so much about speed as it is precision and making incremental progress. That's an unusual tactic for an elite sprinter, but slow-and-steady seems to work for Trenten Beram. At least when it comes to his Rosetta Stone software. The 20-year-old Hopewell Junction resident is using the computer program to learn Filipino. In Beram's estimation, he must become comfortable enough with the language to at least mouth the words to the national anthem. After all, he is a track and field record-holder in that country and, now, a member of its national team. He'd prefer not to be the "American" smiling awkwardly as the anthem of the Philippines is played before international competition. The former Arlington High School standout set a record last month for the fastest 200 meters in Philippines' history. He competed in the Philippine Athletics Track and Field Association Trials in Pasig, completing the race in 21.12 seconds on June 24. His time surpassed the mark of 21.17, set by Ralph Waldy Soguilon in 2007. "It's great and this means a lot to me," Beram said, though he began to chuckle. "I would've never imagined I would set a record. It's kind of hard to believe that no other Filipino has ever run faster than this." Beram's time in the PATAFA Trials, though a record, was short of the Olympic qualifying standard of 20.5 seconds so he will not compete in Rio de Janeiro next month. But Beram did earn a spot on Team Philippines, which will compete in the Southeast Asian Games in Malaysia in August 2017. There, he plans to run the 200 and be part of the 400-meter relay. It's an accomplishment that his father, Glen Beram, joked will often be retold and even embellished in stories to great-grandchildren someday. Trenten dedicated the race to his paternal grandmother, Sandy Beram, who died on June 16. "I'm proud but not surprised because we knew how talented he was from early on," Arlington track and field coach Steve Arnett said. "He's meticulous. Just watching him warm up and run drills, everything was always precise and textbook. He's a force to be reckoned with and he always has that determined look, like James Bond." From the Philippines, with love. ​Beram was born in Scarsdale and grew up in Hopewell Junction. He picked up track in the 11th grade at Arlington but immediately excelled, breaking several Dutchess County records and earning All-American honors. Trenten's father is American but his mother, Nena Beram, was born in the Philippines and moved to the United States when she was 3. Trenten visited the Philippines only a few times as a child, but his ancestry enabled him to apply for citizenship to the country, which then allowed him to compete. Trenten first applied for citizenship to the Philippines last November. He and his mother traveled there to the Bureau of Immigration and spent hours completing paperwork. They went back on June 9 and the process was finalized on June 13, while Trenten was training for the race. The wheels first were put in motion three years ago, though, when the Berams were contacted by a track recruiter from the Philippines who floated the idea of him gaining dual citizenship and competing internationally. The family was put in touch with the president of PATAFA, Philip Ella Juico, who urged Trenten to represent his mother's native land. After a series of email exchanges and two years of college, the Berams agreed. Trenten said he was battling a minor hamstring strain when he set the record and that time wasn't even his personal best. 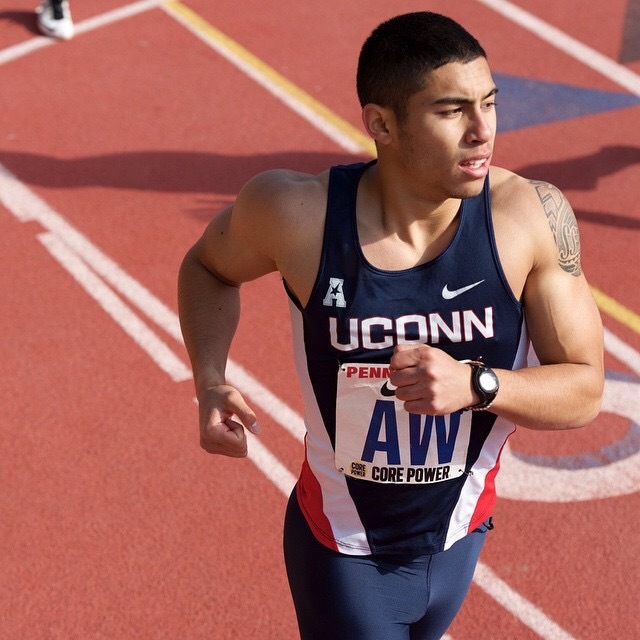 He had run the 200 in 21 seconds last year while competing for the University of Connecticut. But that didn't count as the record, because he wasn't yet a Filipino citizen. He got back to New York on Saturday, and he intends to return to UConn in the fall for his junior year, continue studies for his mathematics major, and compete as a collegiate sprinter. His ultimate goal, however, is to qualify for the Olympics in 2020, representing the Philippines. "Being an Olympian is not something that just comes along and most athletes never get the opportunity," he said. "It would be huge. It's one of the greatest honors that anyone can achieve. I'd want to win, obviously, but I wouldn't worry so much about how I do there. Just getting there would be a big accomplishment." Just reaching this stage in track and field already is a big accomplishment. Beram played baseball in high school and was a defensive standout in centerfield for the Admirals. "Not to brag," he said, "but I made some really nice catches in the outfield." Well, given his speed, one can imagine he had exceptional range. It was on the suggestion of teammates, in passing, that he try out for the indoor track team to keep himself occupied in the winter and prepare for baseball in the spring. "I made nationals my first (season) in track and I started getting college offers," Beran said. "I was blown away. I was thinking, 'This never happened in baseball, so I should probably stick with (the) sport.'" Glen Beram, a fitness buff who operates a gym, said he knew his son would be fast when he playfully challenged his 7-year-old to a race, and lost. After the conversion to track, Trenten soon set school and county records in the 55, 60, 200 and 400 meters, and the 300-yard sprint, according to Arnett, whom Beram credits for improving his strength and stamina. He never did return to baseball. "My first impression of him was like the reaction when you see a Lamborghini parked," Arnett said. "You can just look and tell it's fast. Within three weeks, he was our fastest runner. He had something special and there was no hiding that." Though Trenten didn't spend much time in the Philippines, aside from visiting three times as a small child, he was never far removed from the culture. His grandmother, Carmen Manugas, would visit often. Trenten said he remembers her singing him Filipino lullabies and making his favorite dish, congee, a traditional rice porridge.